ven after a vote from the Cottonwood Heights City Council approving development on the property known as Walsh farm, the debate around the development is still ongoing, as a referendum has been filed to petition the vote and put the issue on this year’s ballot. (This story involves much prior development including the implementation of the planned district development (PDD) zoning, the planning of the proposed development (which is broadly an apartment complex), much public comment including emails and statements to the planning commission and city council from concerned residents, and many other ordinances and discussions concerning the property. For the full context on this story, please visit the previous stories linked or visit cottonwoodheightsjournal.com.) City council vote On Feb. 19, the city council approved Ordinance 317A: the enactment of PDD-1 (Walsh) Zone, approving the rezone of 5.9 acres of real property located at 6784 South and 1300 East from r-1-8 (single family residential) to PDD-1, and amending the zoning map. The approved ordinance incorporated built-in language to require a public trail easement along the creek located on the property. The ordinance required the trail to be constructed, paved with concrete, asphalt, or crushed stone, which would be covered by an easement. Additional modifications included tree preservation requirements, fence height and mixed-use commercial requirements. “We are really excited that our family legacy will be preserved in this new publicly accessible creek-side path,” said Dave Walsh. “This section of the creek was previously off limits on our private property but now it will be shared for all Cottonwood families to enjoy.” The vote was unanimous among Councilmember Scott Bracken, Councilmember Mike Shelton and Mayor Mike Peterson; Councilmember Christine Mikell and Councilmember Tali Bruce were absent. 1 FREE ADMISSION Must present this coupon at the ticket office. Get it Today... No Credit Needed! Get it Today! No Credit Needed! C ITY OURNAL The Cottonwood Heights City Journal is a monthly publication distributed directly to residents via the USPS as well as locations throughout Cottonwood Heights. 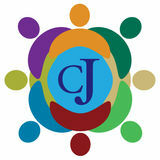 For information about distribution please email circulation@mycityjournals. com or call our offices. Rack locations are also available on our website. For subscriptions please contact: circulation@mycityjournals.com The views and opinions expressed in display advertisements do not necessarily reflect or represent the views and opinions held by Loyal Perch Media or the City Journals. This publication may not be reproduced in whole or in part without the express written consent of the owner. rom placing a pair of live lobsters in the glove box of a paramour’s car to endorsing their boss as a disco-loving ninja on a global career website, to punking fans of the third-largest professional sports league in the world, Utahns know how to April Fools. The City Journals wanted to get up close and personal with some of the pranksters and the pranked in a sort of hall of fame. Look forward to hearing more of your stories, in the comments and for next-year’s piece. Food and fools: Lobsters, an imposter waiter, and under-the-table pranking Long-time radio and web celebs Todd Collard and Erin Fraser (“Todd and Erin”) involve one particular type of food, lobster, as an ongoing April Fools’ staple. One year, Todd, recalls, he actually placed the lobsters in the glove box of Erin’s car. There were no fatalities to report. Rather, the frenetic lobster game is part of the ongoing love affair of Salt Lake City area’s longest on-air-turned-over-web morning personalities. The imposter waiter… Dean Pierose is owner of Cucina wine bar, restaurant, and deli in The Avenues neighborhood of Salt Lake City. Pierose is long-term best friends with comedian Pat Mac. An April Fools’ prank provided the perfect opportunity for Pierose to meet his best friend’s wife. hometown Vivint Arena. The team’s best prank came a few years ago, in 2015, when the Jazz punked fans, commentators, and even readers of the National Basketball Association by launching a new “look-and-feel” three-quarter-length pant. The news went official, with a mock press release and photo featuring Rudy Gobert (27) and Derrick Favors (15). April Fools’ DNA Brothers Jamison and Truman Carter grew up with their prank-playing family first in the Avenues and then Herriman. The two now reside in Salt Lake’s Marmalade neighborhood. The brothers recall stories of their mother’s receiving an April Fools’ Day bouquet of already-dead flowers from high-end florist Every Blooming Thing. Knowing that the bouquet likely cost her then-husband at least $50, their mother called in to complain. Right at that moment, while on the phone ripping the prank-engaging florists who were emphatically denying her description of the bouquet, an incredibly stunning, much bigger and more expensive arrangement arrived from Every Blooming Thing, with the same delivery person. Order restored. The Carter sons were pranked themselves, waking up one April Fools’ morning to a breakfast of meatloaf, gravy, and mashed potatoes. Luckily they tried the odd meal. Their mother, this time, was the prankster, having made Rice Krispie treat “meatloaf” with butterscotch “gravy” and ice-cream “potatoes.” And regarding our last set of pranks? Confession time: I am the mother of the Carters, recipient of dead bouquets, and chef of dreamy April Fools’ breakfasts. Even though it sounds like it could be, that is not a prank. Happy April Fools’ Day, Salt Lake County! fter a year off, the Wasatch Trail Run Series is returning for another round of 13 races in 2019. The series starts in March and April with events in Dimple Dell and Corner Canyon before moving to the mountains with events running through mid-August. The race series organizer, Mitt Stewart, is excited to bring the events back in 2019. “We have a lot of runners who use our events as speed workouts for their training,” Stewart said. “I ran into some of them on the trails last year, and they told me they weren’t as good in races last year without that training.” Each race offers the opportunity to run a scenic trail while getting in a good workout. All races take place on Wednesday evenings at 6:30 p.m. “Wednesday works for a lot of people who can’t get to an event on the weekend,” Stewart said. “That combined with the affordability of the races makes it popular.” Races have averaged around 200 participants in the past, and organizers expect more this year. The Wasatch Trail Run Series is designed to be inclusive. In addition to its Wednesday evening schedule and relatively low registration costs, the races are designed for a range of skill levels. Each event has long and short courses. Long courses range from around seven to nine miles, while short courses are from three to six miles. “People won’t be intimidated,” Stewart said. “There will always be someone at about your level. Most of our runners do multiple races, so you will likely see that person at your level at each race.” According to Stewart, people who participate in the races include competitive racers who use the events to train for speed, people who can’t make it to running events on weekends, and those just looking for a workout. Events often include parents running with their children and people walking the courses as well. Offering over 14,000 square feet of space for funeral services, memorial services, funeral luncheons and a beautiful, onsite cut floral shop. Our Riverton location is here for you. or people who would like to get more involved in the community, April 12 is a good place to start. The day was set aside a few years ago by proclamation to honor two of Cottonwood Heights’s dedicated volunteers. Jim and Kathie Hawkins now use the day as an opportunity to continue to serve the community — and to help others get involved, too. In the days leading up to April 12, anyone in the community can donate stuffed animals the Hawkinses will give to the Cottonwood Heights Police Department. The toys will then be kept in the vehicles of police officers and other first responders in the community to give to children at the scenes of tragic or frightening events. “We thought, let’s do something for the police,” Kathie Hawkins said. “There’s a lot of anger and angst toward police now, but they are always expected to help us when we need them.” While Jim and Kathie Hawkins use the day proclaimed in their honor to do good in the community, they weren’t particularly happy about it at first. “At the time I was very embarrassed,” Kathie said. “We don’t do it to get attention.” But if the community wanted to recognize their efforts, they figured they would make the most of it. “We did a food drive the first year and collected over 1,000 meals for that April 12.” The Hawkinses have each lived in Cottonwood Heights for over 40 years. “I grew up in a military family, and service is important,” Kathie said. “It’s human nature to us.” Kathie and Jim started out small, from baking cakes for neighbors on their birthdays or before leaving for missions to clothing drives for homeless shelters. In addition to helping people in need, Kathie wants their service to inspire others to get involved as well. In a community like Cottonwood Heights, there is no shortage of people willing to lend a hand. Lani Roberts, who owns the 7-Eleven near the mouth of Big Cottonwood Canyon, uses money people put in a jar at the cash registers to donate hundreds of dollars of food and clothing to homeless teens in the county. She plans to use donations to purchase another large donation of food for homeless teens this summer. & Bloxham located in Jordan, Utah is Rebekah Wightman, J.D.South of Sandberg, Stettler, an experienced Estate Planning and Probate & Bloxham located in South Jordan, Utah is attorney. She takes pride in serving clients an experienced Estate Planning andher Probate and providing them a pleasant present and a attorney. She takes pride in serving her clients peaceful future.them Rebekah’s fun personality and providing a pleasant present andand a commitment to her clients, make an often dreary peaceful future. Rebekah’s fun personality and experience “a-heck-of-a-lot-of-fun”! commitment to her clients, make an often dreary experience “a-heck-of-a-lot-of-fun”! Roberts donated over $700 in food for homeless youth in one drive alone in early 2018. “I thought that was really cool,” Roberts said. “Makes me tear up just thinking about it.” The City of Cottonwood Heights provides volunteer opportunities on a more official capacity as well. Residents can volunteer on a number of committees intended to improve the community, from parks and open spaces to the arts council. This time around, Kathie and Jim want to help those who dedicate their lives to serving and protecting the community they have called home for so long. They hope their stuffed animal drive will help officers and other first responders as they serve children during difficult times. The project is intended to help the children while showing them how police officers care for the community. “They are out there for us,” Kathie said. People interested in volunteering on a Cottonwood Heights committee can contact City Hall for more information. To help out in other ways, you can donate stuffed animals to the Hawkinses’ toy drive by April 12. You can also put some change in the jar at Roberts’ 7-Eleven. Or you can take some inspiration from your fellow do-gooders and start a project of your own. and global level.” … And as an honor and an inspiring thought of global contribution March 7, the day before the official day of commemoration, WTC participated in the 10th-annual Women in International Business Conference. This power-packed day included perspectives from 30 business, government, and education leaders representing various facets of Utah’s diverse economy. At the half-day conference, Dr. Mary Beckerle, CEO of the Huntsman Cancer Institute, was named International Woman of the Year. In her role at Huntsman, Beckerle oversees a cancer research laboratory focused on fundamental cell biology and Ewing sarcoma, a type of bone cancer that typically affects children and young adults. All that, an incredibly important role, and yet, Beckerle shared with City Journals deeper insight into the awesome responsibility and opportunity she and other women and men like her bear. “I believe that cancer researchers have a role in advancing global partnerships and understanding,” she observed. “In a sense, we serve as volunteer diplomats as we travel the world to share our results and work together to advance human health.” More than a day, or even a week… a month? Women Techmakers Salt Lake and Miss Nations of the World both identified March 23 as the day for their respective International Women’s Day Celebration event. The Women of the World held its ninth annual fashion show just a few days before the official date. Snowy weather on March 8 scrubbed or severely limited celebratory efforts from Sandy’s Miller Center to downtown Salt Lake’s Capitol demonstration. Regardless of the stormy weather, the message at all events was clear. Women — and girls — are to be encouraged, mentored, and celebrated all day, all week, all month, all year, whether officially or unofficially. inform us?” Bracken said if Russo was given authorization to do so, then it’s not a problem. Councilmember Mike Shelton responded to that question of authorization. “This policy prohibits employees using their title or position whether they were authorized or not. We couldn’t even say it’s OK to do that. This policy prohibits them using their title or position to imply the city’s approval of a political issue.” After a few minutes of debate between the council members, Russo finally responded, saying he was asked to speak on HB 223. “If I am called as a witness, and I was asked to be a witness in this, then I’m certainly going to appear and answer the questions and present the information they are asking for.” “I certainly can go up, out of uniform. I have every right in the world to express my opinion, as does anyone else. In this case, it is a law enforcement issue. It’s an issue I believe is important to the citizens in the city, and in the state in general, so I did support it and I will continue to support it,” said Russo. Peterson then questioned, “When you do that, are you representing the city officially or yourself?” Bruce also asked the question, “When we violate our policy, what is the consequence? I need to know that this policy means something. If nothing comes of this, it’s a clear indication that our policy means nothing.” As the discussion turned to chatter, two potential outcomes were discussed. The policy could be put on the agenda for a later city council meeting to discuss. Additionally, in response to the specific case of Russo working with Poulson, “I’ll have to address it because it’s an administrative issue,” said Tingey. which cost the city around $128,500 for intersection modification and road widening purposes. “This may be the first time we have to more forward with imminent domain,” said former council member and current Mayor Mike Peterson. “It is critical to move forward with this.” During the 2018 calendar year, many of the public works conversations mentioned the intersection in some capacity. On June 12, Public Works Manager Matt Shipp reported that the project was out to bid. A few months later, on Sept. 11, he reported that the bid was completed, and the public information process was beginning. “It will be impactful for traveling residents,” Shipp said. Funding for this project is being pooled from multiple sources. On June 19, 2018, the Cottonwood Heights City Council voted unanimously to approve an interlocal agreement with Salt Lake County for a grant of over $3,000 in Corridor Preservation Funding. Now, in 2019, construction is under way. Residents and commuters will experience traffic delays due to the intersection construction until June, at the earliest. Drivers are already experiencing frustrations, as many of have been trying to cut through the Dan’s parking lot. There is now signage urging drivers not to cut through the surrounding parking lots. Especially since cutting through parking lots is illegal. 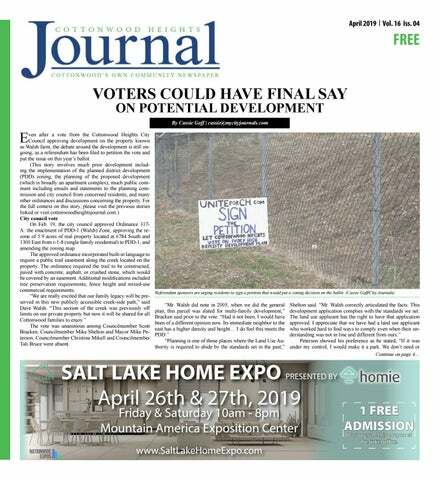 To stay informed on the construction details and progress, join the email list by emailing UDOT’s Public Information Manager Amalia Deslis-Andrews at adeslis@ utah.gov with “Highland Dr.” in the subject line. Treating you like family for over 34 years. Free by a Apprais appcertifiedal on inraiser appo itial intm ent! -Personalized Service -Local Market knowledge -Top Quality representation Buying or selling a home should be a fun and pleasant experience. With 34 years of working throughout Utah, I can help you enjoy the journey of finding a new place to call home. “INSURANCE” is not a nasty word. The other person didn’t have insurance in my car accident! Allstate has your back with Uninsured and Underinsured coverage. Disaster struck and we had a home fire! My husband had a heart attack! Your Allstate Agent can help your family with life planning. Allstate is there with help and a check to get things moving the next day. Want to know the truth about Reverse Mortgages? My siblings and I want mom to be secure in her home with her fixed income. Can a Reverse Mortage help with that? I want to leave a legacy to my children. Will having a Reverse Mortgage on my home keep my children from inheriting my estate? I’m 62 and concerned if I need to cover medical bills or long term care. Can I use the equity from my home with a Reverse Mortgage to pay those costs? We’re ready to get the answers - Who do we need to talk to? You should be making memories, not mortgage payments Call me to see if a HECM is right for you! tial months when first-graders are enrolled in the program. First-grade English teacher Michael Vierra at South Jordan’s Monte Vista Elementary said the popularity of the DLI program has grown and he is teaching 25 to 28 students per class. “I reinforce what students may not understand initially in Mandarin, but they quickly learn and have an awesome experience learning a language, usually from a native speaker and teacher,” he said. “They become independent very quickly and realize if they don’t know how to do something, they have to be able to learn and express it in the language.” Many of the DLI language teachers are on a visa to teach in Utah, meaning that there is a turnover; so English teachers help them learn the ins-and-outs of the program, Vierra said. “There always is some adjustment from how they teach in China or Taiwan, and they have to learn to American style of living, but the benefits of having a native teacher outweigh any challenges,” he said. Eastlake Elementary, in South Jordan, like many schools, have host families help DLI teachers from China and Hong Kong set up their housing, transportation, banking, and get their social security cards and driver’s licenses when they arrive a couple weeks before school begins to attend state dual-immersion training. “They’re usually on a three-year contract so there is a constant learning curve,” second-grade teacher Teresa Wang said. “They learn to teach more interactive, bring in their culture, not just give lectures.” In her own classroom of second-graders, Wang focuses on childhood activities. Last year, Midvale Elementary fifth-graders perform “Chinelos de Morelos” during the school’s third annual “Kids are getting a broad vocabulary Cinco de Mayo celebration. (Julie Slama/City Journals) of daily words that help with conversation. Award winning program Canyons School District recently received the Melba D Woodruff Award for Exemplary Elementary Foreign Language Program from the American Council on the Teaching of Foreign Languages. The district was chosen to receive the national award to honor the program that aligns with the World-Readiness Standards for Language Learning curriculum, has proficiency targets set for each grade level, and has teachers that are highly qualified, lifelong learners. hen Denise Haycock talked to Real Salt Lake and Utah Royals professional soccer teams’ owner Dell Loy Hansen, the Canyons Education Foundation development officer didn’t know it would result in Canyons School District elementary teachers being offered one-third of $1 million. Haycock introduced herself, and Hansen jumped right in with, “You’re going to want to know me. I like schools.” They met two days later, and then a couple weeks later, in January, they rolled out a plan where Hansen would fund elementary teachers $250 after they applied through the pilot program, Scoring for Schools. He also funded similar programs in Jordan and Alpine school districts, bringing the total to $1.2 million donated for teacher grants. “I couldn’t say no,” Hansen said. Two weeks later at the end of January, the teachers’ proposals were funded and schools were celebrating with their new classroom supplies in February — complete with RSL’s mascot, Leo, spraying students with silly string and several players from both RSL and the Utah Royals giving students high-fives. “He funded everything,” Haycock said. “This donation is the largest single gift the foundation has ever received and it’s making an immediate difference in classrooms in every corner of Canyons district.” Hansen, the president of Wasatch Property Management, said he realized he had a knack for building homes and business and not the family business of being a teacher. As a son, grandson, nephew and brother of teachers, the value of education is ingrained in him, so he committed to helping. “My penitence for not being a teacher is to take care of teachers.” By knowing his donation would go directly to classrooms where the money would make the most difference, he compared it to his three teams — the Utah Royals, Real Salt Lake, and its reserve team, Real Monarchs. can get better fast so they can get back to their activities and their work.” Here in Utah, Dr. Gibbs is more likely to be treating an injured snowboarder than a linebacker, but the satisfaction of seeing them get back to what they enjoy doing is just the same. In fact, Dr. Gibbs (a native Utahn) is an active skier himself, which helps him treat patients who incur injuries from any of the adventure sports that Utah has to offer. “I know what the demands of those sports are on the human body and so I think I have a unique perspective when it comes to getting patients back to doing the outdoors things that we have here in Utah—hiking, skiing, mountain biking, snowboarding, cross country skiing.” Dr. Gibbs and Heiden Orthopedics are committed not only to helping patients heal, but also making sure that they stay healthy and avoid future injuries. “That’s why I work so closely with physical therapists to help patients stay in good shape. That’s going to help them in the long run to avoid having to come see the orthopedic surgeon,” he said. pring is upon us, summer is on the way; and with warmer temperatures and (hopefully) blue skies on the horizon, drivers can’t blame slick roads or blinding flurries for their faulty driving anymore. Driving safely requires good driving habits. Habits. Not occasionally safe maneuvers. The following are some prudent practices to implement in your daily travels. troubling and you probably shouldn’t be behind a steering wheel. Also you can’t always see what’s in front of the car before you. They may have to slam on their brakes due to an unexpected obstruction. If you rear end them, insurance rarely works out in your favor. This can also mean slowing down on wet roads or not weaving in and out of traffic. Distractions This is the No. 1 reason for accidents. This is not limited to using the cell phone, though texting, checking news alerts or making a phone call are all terrible decisions to make while driving. It also extends to dozing off or checking the price at the gas station you just passed. Be alert, stay vigilant. Other drivers may suddenly stop, they may not see you as you yield or turn. By staying engaged and sharp, your reactions can be sharper and you may even anticipate what other drivers are looking to do. One way to stay engaged is to vary your daily commute. Changing your routine alerts your brain, breaking you from the monotonous snooze you may find yourself after traveling certain routes hundreds of times. These habits are important and it is not overdramatic to say that they could save a life. advance to the state tournament. Though Brighton captured the Region 7 title a year ago, runner-up Alta ended up winning the 5A championship. the game and enjoy being with one another. Ultimately, she’ll measure the quality of the season by how well the team bonds. “This season will be a success if all players can walk off the court each time they play and say that they gave their all, had fun and learned from their match,” she said. “I can honestly say each one of them plays with heart. The season will also be a success if they can gain lifelong friendships from their teammates and continue to teach the game to future generations. fantastic season got even better at the end of February for the Brighton High School cheer team. The Bengals took part in the JAMZ National Competition in Las Vegas, Nevada, placing second in their division among 200 of the top squads from across the country. Head coach Micah Worrell was thrilled with the accomplishment. “Overall, the competition went really well,” Worrell said. “Even though we didn’t take the title as national champions, I was impressed and extremely happy with how our team did. It’s still a huge accomplishment to go nearly undefeated all season and then to take second in the nation.” Brighton almost didn’t achieve second place at the national competition. In fact, the Bengals nearly didn’t make it to Las Vegas. Things started off on a bad note when the team’s flight was canceled. This turned a quick trip in an airplane into a grueling 12hour bus ride through the snow. By the time the Bengals finally arrived in Vegas, they found they didn’t have any practice rounds available because the event staff didn’t have enough people to cover all the stations (due to additional flight cancelations). To complicate matters even more, it was difficult checking into the hotel because credit cards weren’t working. “The trip was a complete nightmare,” Worrell said. Worrell worried that his team would be mentally burned out and exhausted after this fiasco. To their credit, the athletes shook off the disappointments and ordeals to put together fantastic routines. “The team stepped up and knew they were there to do a job, and they delivered,” he said. “It goes back to the mentality I try to teach all my athletes I work with: No matter what happens in practice, school or life, there are zero excuses for not putting your absolute best out there.” The competition was intense at the event. The smallest error could send a team far down in the standings. Worrell knew the team had to be at its best. Brighton’s athletes excelled and thrilled their coach. “What makes it memorable for me as a coach is when the team knows that they hit their routine and gave it everything they had,” he said. “The moment the music stops, you can see their faces light up, and the tears start coming because they are proud of their performance. They are proud of their team and all the hard work they put in to get there. That’s what makes all the practices, stress and chaos worth it to me.” It’s been a unique season, to say the least, for the team. Worrell stepped in and took over the team after the previous coach resigned in September. The unexpected change made the first part of the season hectic. ical costs, prepaid interest, and education expenses. Remember when that clerk asked you if you wanted to round up your total to the next whole dollar, so the change could be donated to charity? Find that receipt. Even those small donations can be deducted. (I’ll be dumping out my shoebox of receipts all over my house, anyone else?) Go back to school! Refundable education credits can deduct up to $4,000 from tax liability. Additionally, families can deduct up to $2,500 on student loan interest. (That may not make up for rising tuition prices, but right now we’re only focused on maximizing that return!) That “credit” word. Pay attention to those. Tax credits subtract directly from your tax bill, while tax deductions reduce your tax bill in proportion to your tax rate: they lower the amount of income the IRS can tax. In other words, tax credits are independent. While you (and your recommended tax professional or software) are weighing out the credits and deductions, you might weigh standard tax deduction and itemized tax deductions as well. It may be the case that itemizing your deductions can help you get a bigger refund. Keep banking on that retirement. If you’re contributing to an employer-sponsored 401(k) or/and an IRA, that can help reduce your taxable income, maximizing your refund in return. Lastly, make sure you make it to that retirement. Contributions to a health savings account (HAS) can also maximize your refund. As with any important documentation, check, re-check, and triple check. Make sure you’re submitting paperwork before April 15. Make sure everything, especially names and addresses, and spelled correctly. Take the time to read over all the paperwork one last time to ensure everything looks correct. You know, cross those t’s and dot those i’s. No one wants the dreaded phone call or letter from the IRS. Thank you to everyone who gave me guidance for this article! Wishing you energy and clarity to make it through the end of busy tax season! NOW OPEN! Try our Chile Verde Burritos and Carnitas! Vegetarian & Gluten-Free Dishes available. We CaTer eVenTs oF all sizes. Coupon must be present. Expires 4/30/19. FREE Pizza! BUy Any siZE piZZA AnD GEt tHE 2nD onE oF EQUAl or lEssEr VAlUE FrEE Valid Sunday - Thursday Only. Expires 4/30/19. cash and $67 in pennies. What can we get with that?” His face fell. He waved his hand in a vague direction that could have been behind him or downstairs, then walked away. We wandered until we found a machine that could dry our clothes. We purchased it and ran from the building, making no eye contact with any sales-zombies in the area. The new dryer is beautiful. It’s shiny. It’s not coated with lint-covered laundry detergent. It actually seems kind of haughty, so I’m glad we didn’t buy it a pedestal. We assure our old washing machine that it’s still a valuable part of our family. We hope positive attention will keep it working for a few more years, but it’s also in the tweenage stage, so I’m expecting tantrums and/or the silent treatment at any time.